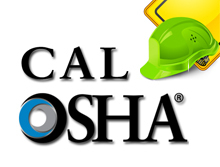 Cal OSHA: Are you compliant with Cal OSHA regulations? The Cal/OSHA enforcement unit has jurisdiction over every employment and place of employment in California which is necessary to adequately enforce and administer all occupational safety and health standards and regulations. The Cal/OSHA enforcement unit conducts inspections of California workplaces in response to a report of an industrial accident, a complaint about an occupational safety and health hazard, or as part of an inspection program targeting industries which have a high rate of occupational hazards, fatalities, injuries or illnesses. Safety Program) that is custom tailored to fit the specific needs of your operation.